SUPERWANI: Fun April is over.. I really want to write in here more often. But every time I want to start, the guilt feeling come like..wani..you haven't do this and that, and I have to settle those first. You know, the rule of priorities. My working nature at the moment is something which rarely have dead lines. Only at certain time I will be very busy and require to stay longer at the workplace. What I hate the most is ambiguity in time management a.k.a waiting. Gaahhh! !I wish my tolerant to waiting will improve by time. Ever since day 1 in here, my mind has been constantly at home. For your information, he was on a month holiday in the past month and really had fun every day in a very cool way and that got me jealous and had the urge to go home when the clock just strikes 3!ahaha xp. So I was home when it was just 3 most of the days. sigh...Yang lebih parah, I secretly wished the cells don't grow or the mice died so that I don't have to work long hours or even to receive calls from the students. It became so scary that so far all that wishes got granted? ?It's like the universe listen to me, a girl with a simple wish; i.e. to spend more time with his husband (and they are living together under the same roof, and the house is small). For that, I need husband to start working as soon as possible. Little that I know, watching games live is so much fun. And my name means fun too #kidding. So, this is apparently my thing. Just realized it when I'm about to enter 30. Still young, still young. I love how it could be nerve-wrecking at some points and immediately change to a rush of endorphins! We love it too much it is has become our weekly activity. I would prepare bentou (packed lunch/dinner) for us during the games (everybody is like having picnic in the stadium) and he will pay for the tickets. bahaha xp. He is so semangats, he bought each of us the props and the highest quality jersey. lol xp. I think the main factor of our excitement is due to the fact that Hiroshima baseball team is on the lead. 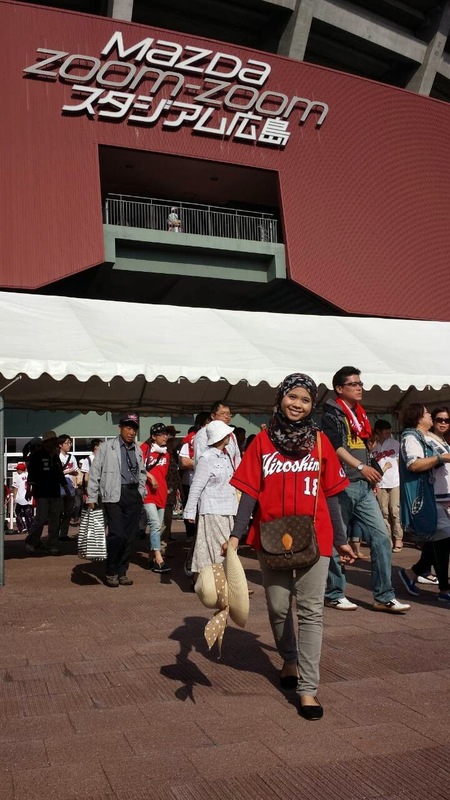 Go #Hiroshimacarp . Yes, carp is a fish. #dontask . Here are some of the photos to share! It was so hot I can't open my eyes. Hence..oh, and I wish Mazda would upgrade the stadium to a dome. Baru tak panas. 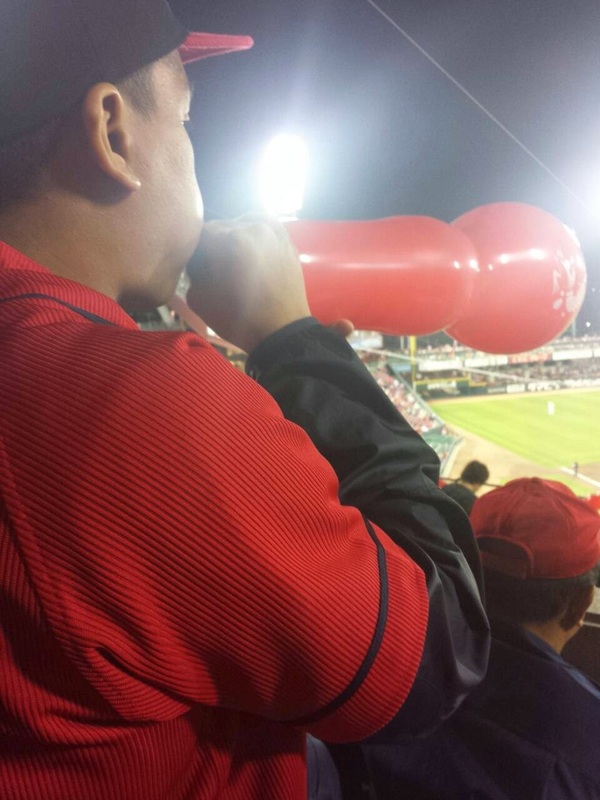 This was during the night's game. 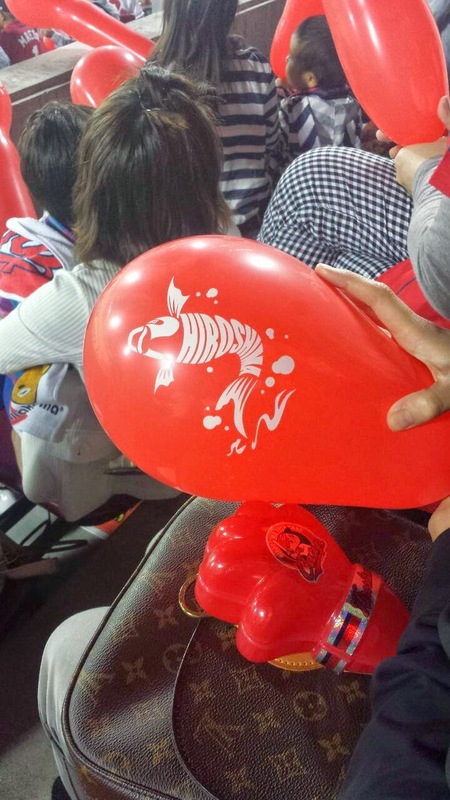 An aunty sat next to me handed me balloons so that we can join the lucky 7 cheer. To husband, happy working and your life of 'playing golf everyday' has over. That day will come again maybe when you are 60 years old. ahahaha! !